Happy Runners Day everyone! 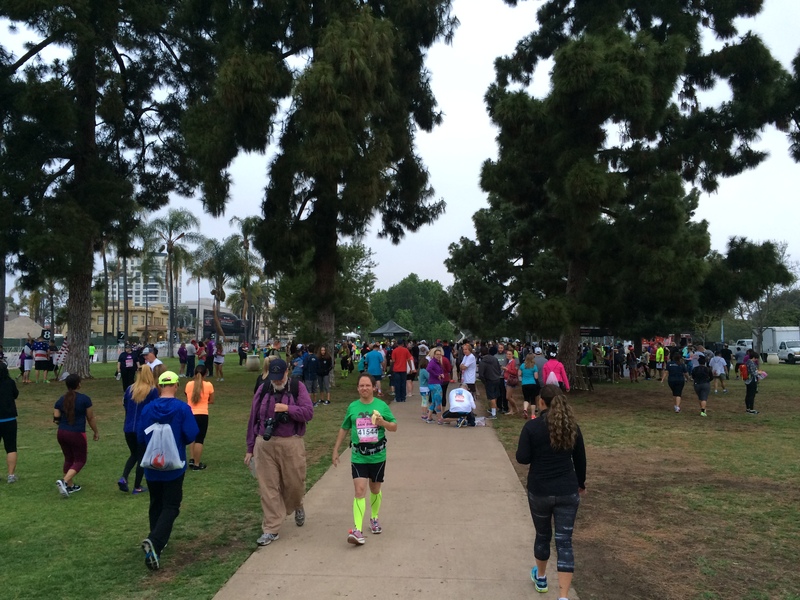 I thought to myself….what better way to celebrate runners day than with a recap of a race? 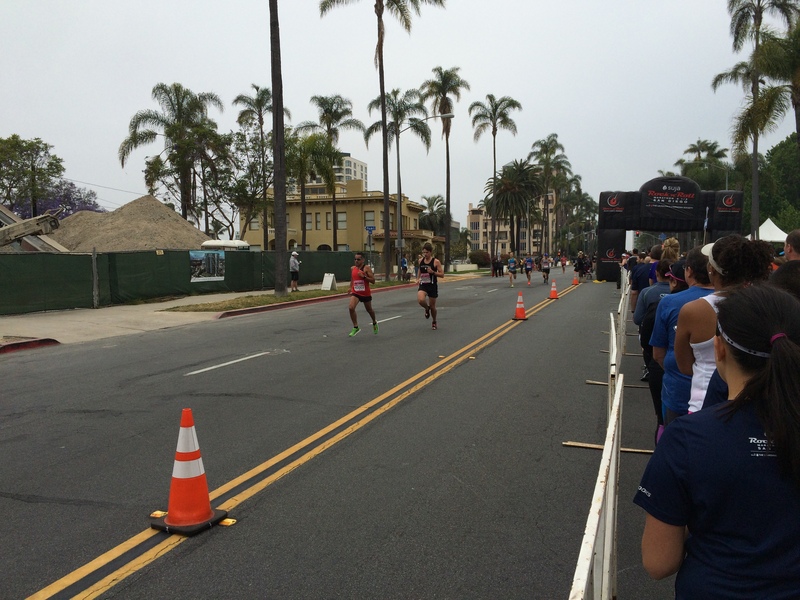 A few months ago, I got an email from the Rock n Roll San Diego that said Meb would have a meet and greet at the end of their brand new 5K race. Since you never know if you’ll actually get to see people like Meb at an Expo, I decided to sign up and add the 5K to the half marathon I was already registered for. Plus, I’d be able to get a third medal for completing the new Remix Challenge. When I made my hotel reservation, there was mention of a free shuttle to the start line. What I didn’t know is that the shuttle was only for the marathon/half marathon day. So, I ended up walking the mile and a half to the start line. It actually wasn’t a bad walk at all. As if 3.1 miles were not enough for the day, I added another 3 miles of walking to the mix. 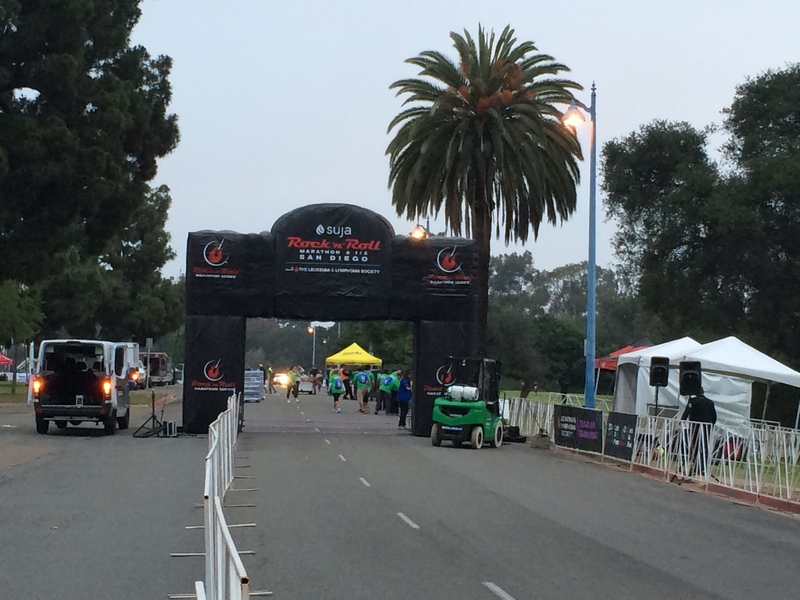 On the way to the start line, I got to walk by the finish line! This was the first year for the 5K race. So, there was not any information about this course beforehand. The map showed that there would be a couple switchbacks around Balboa Park. Even with the lack of information, I had a goal of setting a new 5K PR. That meant I’d need to finish faster than 32 minutes, 46 seconds. To be fair, I haven’t exactly raced that many 5K’s since setting that mark back in 2012. I have been to San Diego many times but never visited Balboa Park. It’s a really nice park and a great place to stage a race! I arrived with plenty of time ti roam around beforehand. I was all ready to start! Before I knew it, the time had come to get into my corral. For the 5K, there was self seeding. If I remember correctly, there were roughly 3,500 people running in the 5K. One thing that kind of sucked is that, because the course went up and back past the start area, the corrals only had half the lanes available to us. For me, it meant that I was starting in the 11 minute per mile group. As you can see, there was quite a crowd. The thing I hate about being a slower runner is all the waiting we have to do before our corral gets to start. Don’t get me wrong, those who are faster have earned the right to wait less. It’s just a bummer to wait. 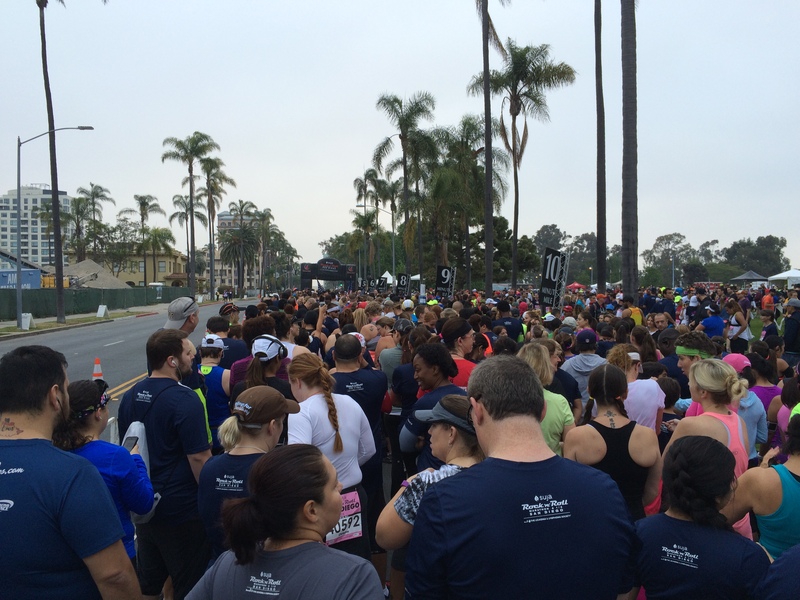 My corral waited so long, we got to see the leaders of the 5K pass by us before we even got to start. The picture above is of 2nd and 3rd place. The guy who was leading was pretty far ahead of the 2nd place guy. 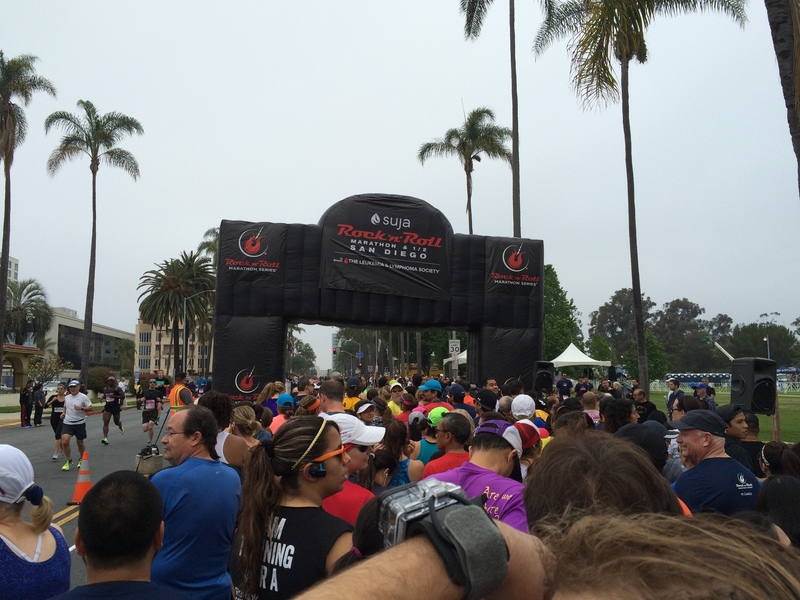 As we got close to our start, I was looking at my watch and wondering if I’d get to see Meb. He was pacing the 7 minute per mile group. Right as my corral started, I saw Meb pass by with his pacer sign. Oh, what bad timing. Sadly, I don’t have a picture because I was close to the start line when he passed by. Running a 5K is very different from running longer distances. You’ve pretty much got to go, go, go, go. So, I didn’t take any pictures along the course. The focus was on hitting a PR. Run 30 seconds, walk 60 seconds for a mile and a half. See how I felt. If I was up for it, make the switch to run a minute, walk a minute. The first mile is where the rolling hills began. Each mile had some rolling hills in it. The first mile went really well! I went off faster than I do in training! This was a really good feeling! The course went up a little more than a half mile before turning around. I was feeling strong and good. The mile 1 marker was pretty much right where my GPS said it would be. Mile 1 was finished in 10:21! The second mile went downhill for around 3 quarters of the mile! I kept my run/walk intervals going. Because I was going fast enough, and saw that the finish of the 2nd mile was largely uphill, I decided not to make the switch. Although, towards the bottom of the hill, I did run more on the run intervals because I thought I might lose some time coming back up. Mile 2 was finished in 10:21 as well! Talk about consistency! The third mile began uphill. There was a water station just past the 2 mile marker. On short runs like this, I usually don’t take water. So, I passed by and kept going. The uphill didn’t last too long. However, I could already feel the effects. There was another quick downhill. At 2.5 miles, it flattened out for a few tenths of a mile. This is where I began to lose control of my breathing. I was pushing hard. However, I knew that there was another uphill portion left. So, I did not switch up my intervals. Then, it happened. I stopped a run interval short because I had lost control of my breathing. When I’m on longer runs, it’s okay to walk a little extra once in a while to get the breathing back under control. However, in a 5K, loosing control can be the death of a PR attempt. By 2.7 miles, I skipped a run interval altogether because we were going uphill. That’s when the PR attempt ended. By 2.9 miles, I had regained control over the breathing and decided to run all the way to the finish line. I was at 33 minutes when I started the last sprint to the finish. So, I was sprinting for a new 2nd fastest 5K. 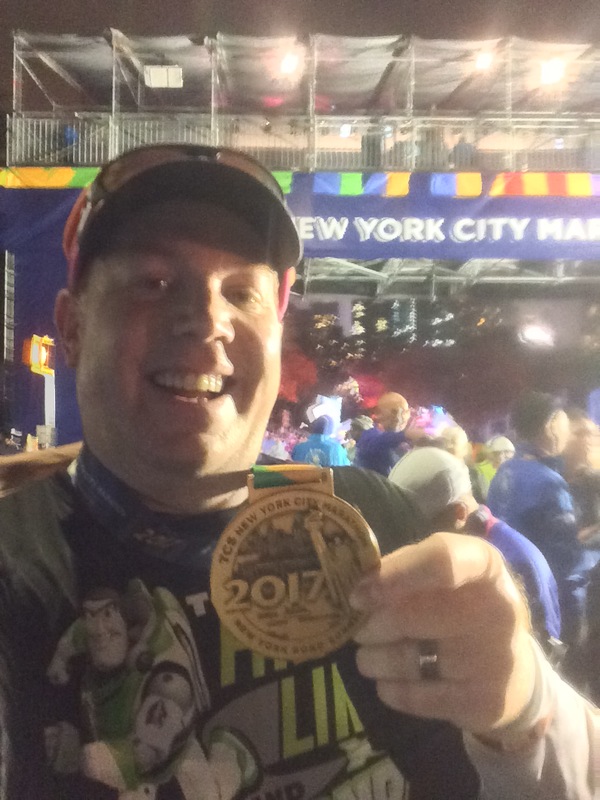 I finished the race in 34:10. It wasn’t the PR I had hoped for. But, it was still pretty good. If I hadn’t lost control over the breathing, I’m convinced I would have had that PR. I mean, my first 2 miles were finished in just under 21 minutes. That might be the fastest I’ve run 2 miles! There was just one too many climbs to make on this run for me on that day. It’s okay. I was happy with the result! After getting my finishers medal and some water, I walked around and saw this guy. 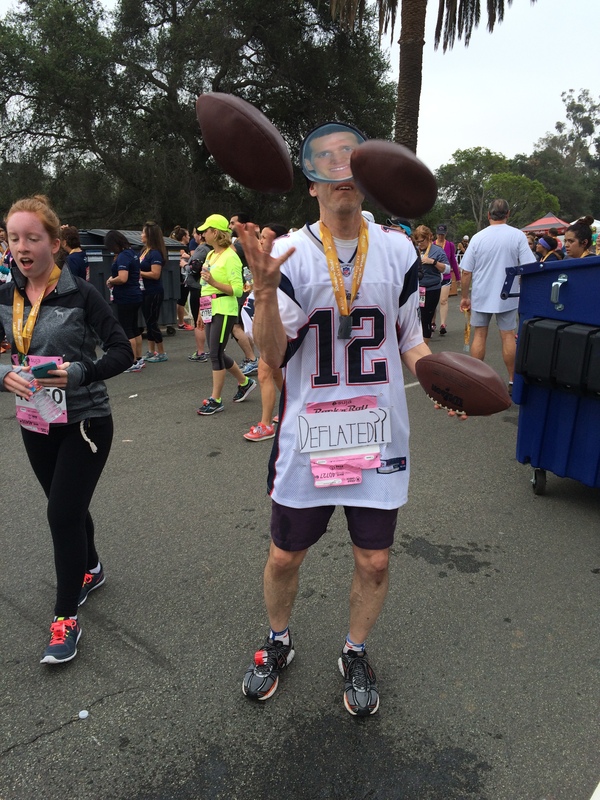 He ran the entire 5K juggling the footballs and dressed as Tom Brady. The whole deflategate controversy is what inspired his race gear. It was too funny! 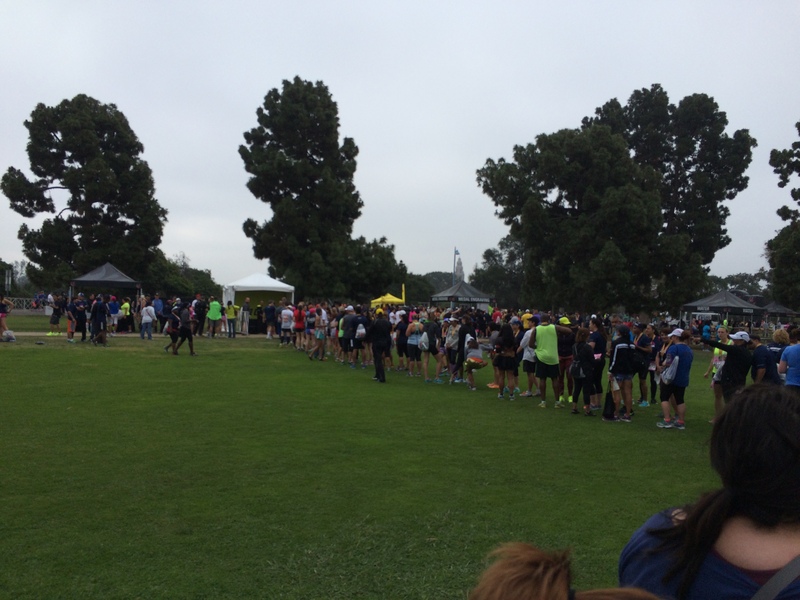 A little further from the finish area, I saw this long line. Meb was there! 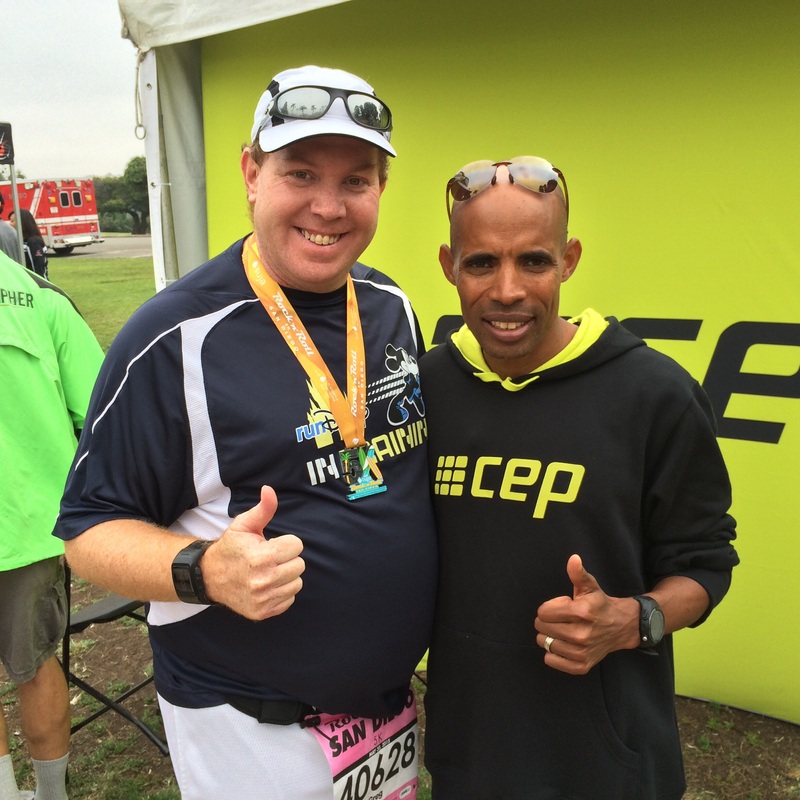 This is why I signed up for this race…to meet Meb at the finish. I know that I had already met him the day before at the Expo. This time, though, it was a finishers photo with Meb. So, I hopped in line. Good thing I got in line when I did. They cut the line about 5 or 6 people behind me. I don’t think I’ll ever have a better finishers photo than this one. Back of the packer with Boston Marathon and New York City Marathon Champion. Life is good! Overall, I loved this race! It’s been so long since I’ve raced a 5K that I forgot how short the distance actually is. After finishing, I couldn’t help but wonder what would have been if I realized how close I was to the finish line when I gave up on that first run interval. If I’d kept going, this might be a post about a new PR. However, given this result, my race calendar is pretty set for the rest of the year. 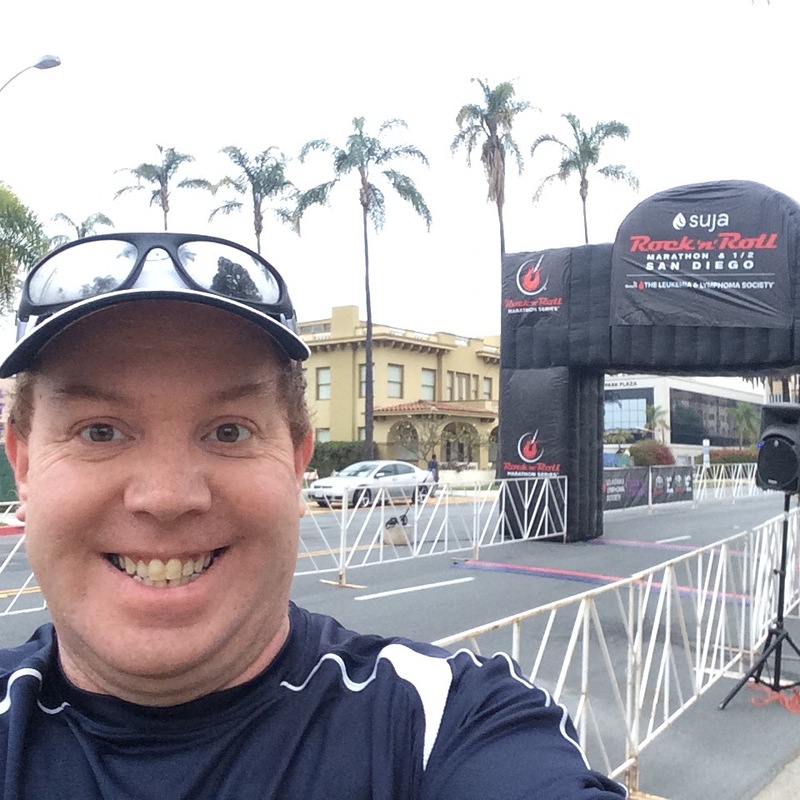 I’ll make another attempt to PR the 5K distance at the Awesome 80’s run in Pasadena July 18th. 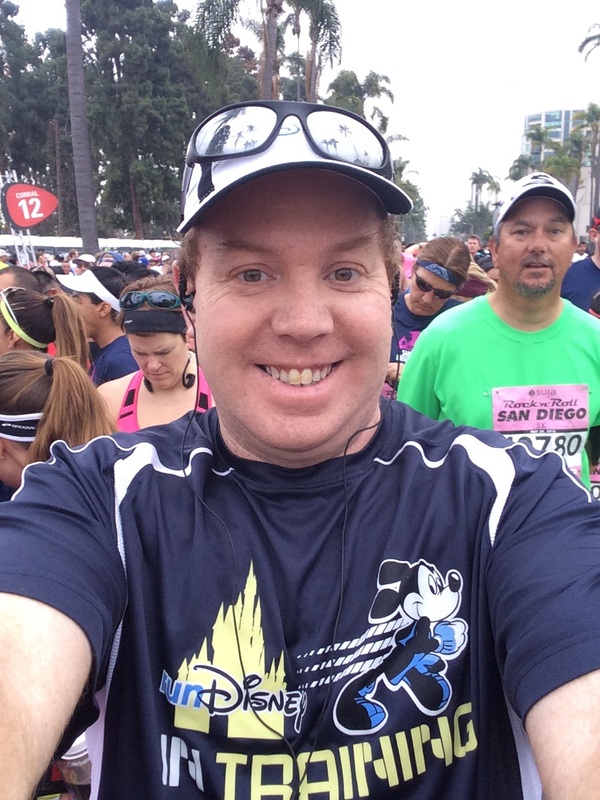 I’ll also be attempting a 10K PR at the Disneyland 10K race this year. It’s really good to have that clarity. Plus, who could complain when you get to meet a Boston Marathon Champion at the end of a race? You know what I mean? Saturday was a great day! I’ve really got to hand it to the folks at the Rock n Roll Marathon Series. They put on some great races! Nothing will ever beat running through Disney theme parks. 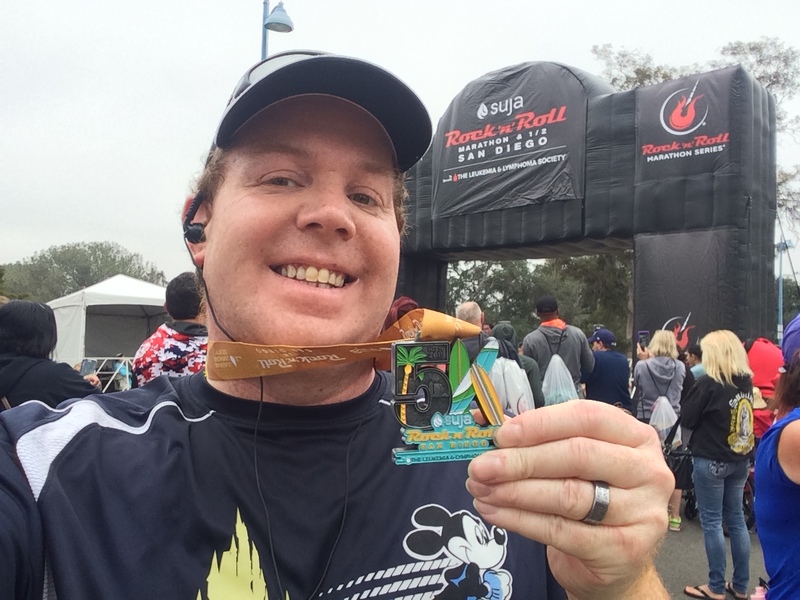 However, the Rock n Roll series is a close second to runDisney in my book. On this National Runners Day, I’d encourage you to visit their website and sign up for a race. You can get up to $20 off today! What are you doing to celebrate National Runners Day? great job-I feel like 5ks can be super risky depending on course crowding and other issues that can really effect your time.